Glenn Mackintosh is the Founder of Weight Management Psychology. 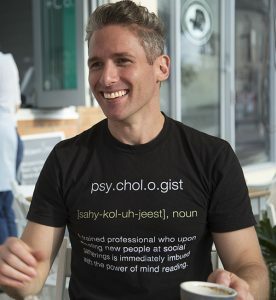 His public work has seen him as the resident psychologist on Ten’s The Biggest Loser: Transformed and he is a weekly contributor on the psychology of health for Style Magazines. He is a member of the Australian Psychological Society, a fellow of the Obesity Prevention and Treatment Society, and the Queensland representative for the APS Psychology of Eating, Weight, and Body-image Interest Group. Before venturing into full time private practise, he was the Director of Psychology at the Wesley Lifeshape Clinic, and he also consults with Qld Bariatrics patients pre- and post- surgery. Glenn’s passion is in helping people manage their eating, physical activity, weight, and body-image and training other professionals in applying psychological principals to help their clients who are grappling with weight management issues through his sold-out professional workshops, online courses for Personal Trainers through the Australian Fitness Network, and online courses for dietitians in conjunction with Dietitian Connection. He is enjoying spreading evidence-based, weight-inclusive, innovative messages in his practice, the media and public life. Womens Fitness – Fitspo or Fit Fail? Glenn speaking at the In Business In Health conference with Tim Robards (Tim Robards Method) and Leanne Ward (The Fitness Dietitian), led by Tara Diversi from Health Leadership Australia. Glenn presented on an interdisciplinary webinar panel exploring working collaboratively to support mental health of people living with obesity for the Mental Health Professionals’ Network. For more Dietitian Connection podcasts, click here. Hey Buddy!, I found this information for you: "Glenn in the Media". Here is the website link: https://www.weightmanagementpsychology.com.au/glenn-in-the-media/. Thank you.